I’m a bit late writing this blog entry, the result of a couple of days’ sojourn in Carmarthenshire. We had a great time in South Wales, and included in our crowded itinerary re-visits to three graveyards of significance to the Welsh branch of the Bankes Pedigree. Well, I have to confess that I have mislaid the photographs we took on our previous visits, and as the Bankes Descendants’ Reunion is now only a few weeks away I am trying to ensure that I have available as much material possible for the big day. The three graveyards we visited were St Bridget, Llansantffraid and St Michael, Llanfihangel Ystrad, both in Cardiganshire, and St Cain, Llangain. The first of these is located on the Cardiganshire coast. We arrived there at about lunch time, mainly looking for the graves of members of the Herbert family. David Herbert (abt 1767 – 1835) was vicar of this church, and in 1796 married Mary Price (abt 1777 – 1856), daughter of Joseph Price (abt 1747-1817). As far as we know Mary & David had five children and when David died in 1835 his son, William Herbert, took his place as vicar of this parish. William was vicar of Llansantffraid for 48 years and lived to the ripe old age of 98. As was the case when we previously visited this church, we were able to go inside the building and photograph the memorial to the Herberts on the East wall of the church. It is a lovely church, set high above the Cardiganshire coast. Many of the graves bear witness to the fact that many of the people who lived here in the nineteenth century were mariners, and the hazardous nature of their daily lives. A number of the Bankes descendants were mariners. Next we went to Llanfihangel Ystrad, which is situated a few miles to the west of Lampeter. We had a list with us, detailing the graves thet we had photographed some years ago, so finding them now would surely be easy! Well, perhaps not! We made several circuits of the graveyard but still failed to find some of the graves. This doesn’t really matter much, as we already have a record of the inscriptions, but it would have been nice to be able to complete the job. Last time we visited this churchyard we had difficulty finding the graves of Charles Davies and the above mentioned Joseph Price, both of whom died in 1817. Eventually we realised that they must be the two graves that were covered (and I do mean covered!) in ivy over towards the gate. 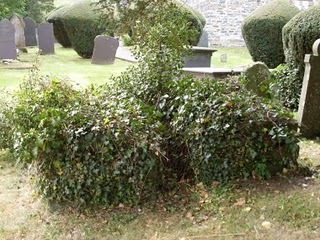 I had to strip the ivy off the graves before I could confirm that these were, indeed, the graves of Charles and Joseph. Well, by the time of this latest visit the ivy had well and truly covered these graves again. I saw no real need to attempt to remove it this time, so photographed them as they are. Joseph Price was a son of John Price (abt 1720- abt 1756) and Deborah Rand (abt 1722 – abt 1765), who I regard as the founders of the Welsh branch of the Bankes Pedigree. They lived in Llanfihangel Ystrad, and I believe it highly likely that they were buried in the churchyard ao St Michael’s. However, there is no stone in their memory, and the burial records for the relevant years have apparently been lost, so there seems no way of researching this. Later in our short stay in Wales we visited Llangain, a small village just outside Carmarthen, to re-visit the church of St Cain. Here are buried Charles Bankes Davies (abt 1825 – 1870) with his spouse, Mary Ann, nee Rees (1819 – 1897), and their son, another Charles bankes Davies (1859 – 1925). We found all these graves and photographed them, but noted that whereas when we visited them a few years ago they were quite easily read, by now the stones have become covered with a brown coating, and are all but unreadable. On returning home I recalled that a couple of years ago we visited the library in Swansea and I found an interesting book on the hisitory of Llangain (The Book of Llangain by Haydn Williams, pub Halsgrove, 2007). This book contains some photographs of the rather grand house that is Lwyndu, the Llangain home of the Bankes Davies family until it was sold in 1926. There are photographs of the house, the coach house and the lower lodge (which we have seen previously). There is also an obituary to Mary Ann (Rees) Davies, that was published in The Welshman when she died in 1897, and information about the Bankes Davies family. Appparently, inside the church there is a memorial to Charles Bankes Davies and his son of the same name. I’ve copied all this stuff for possible use at the Reunion in June. Yes, the reunion is now that close! We are busily working towards what we hope will be a smashing day. If you are a descendant of one of the siblings of John Bankes, Citizen & Haberdasher (abt 1650 – 1719) please do book a place at the reunion. People are coming from near and far, and we are really looking forward to meeting you all. In the next few weeks we will be sending information to all the people who have booked, telling them how to find the Reunion venue and information about timings etc. In the meantime, I hope May is good to you.